Small business and consumers are looking forward to the deployment of 5G wireless technology. Already having benefitted from the investments made in broadband technology and networks – both wired and wireless – the entrepreneurial sector of our economy understands the further substantial innovations to be generated from the deployment of 5G networks hold greater rewards, such as vastly enhanced speed, reliability and access. This is critical for small businesses to compete and grow, especially in underserved areas, like rural America. SBE Council hosted a roundtable discussion on March 14, 2018, which covered the implications of 5G for the economy, entrepreneurship, and small businesses across industries and the nation. FCC Commissioner Brendan Carr was part of a discussion emphasizing an FCC order that would streamline the deployment of 5G in reference to potential federal obstacles. Thankfully, that order passed the FCC on March 22. 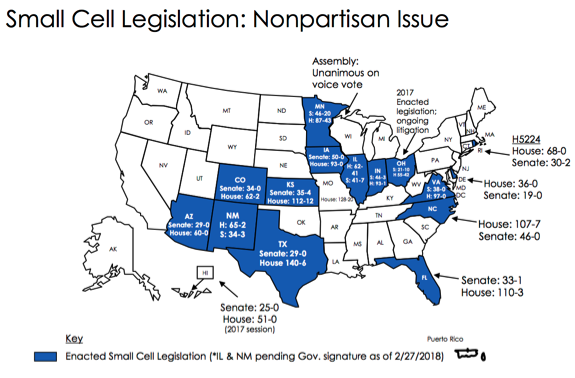 As noted in the accompanying map from the CTIA – The Wireless Association, by February of this year, at least 15 states had passed smart cell legislation that modernizes procedures, makes it easier and reduces costs to make critical investments in 5G, thereby expanding access to affordable, reliable and advanced networks. In addition to those noted in the CTIA map, in Utah on March 20, Governor Gary Herbert signed the Small Wireless Facilities Deployment Act, which had passed the state legislature unanimously. 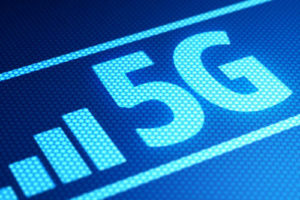 State lawmakers who rationalize the process for deploying 5G networks will open the door to more investment and innovation in their states, with residents – including consumers, entrepreneurs, small businesses, educational institutions, medical providers, and large firms – reaping tremendous benefits.